It was a weird morning at the Millers. With the river low, the fish weren’t in their usual spots. I guess they’re roving. So, I explored a bit. Also, maybe because they’re more seasoned or somewhat wary because of the low water level, but I found them very picky regarding flies and how they wanted to see them. Spot A is my bread-and-butter stretch. It is a highly-pressured area of the Millers that has produced consistently for me. But, after casting around for a bit, the fish weren’t there. Huh. So, I started moving around. 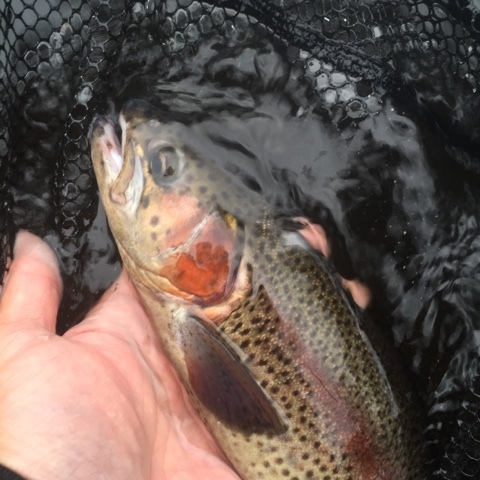 But, the trout were very particular on what fly they wanted. 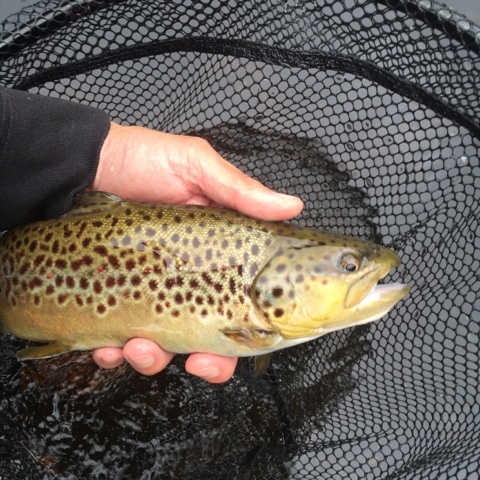 After seeing some caddis pop and aggressive rises (I’ve read that caddis pop quickly, and so, fish learn to aggressively take them before they fly away), I put on my favorite Caddis Emerger. That started to work right away, and most takes were on the rise. None of my other “usual” flies worked. So, I worked thoroughly that particular stretch, and it was fun to cast downstream and swing the emerger as a wet fly. 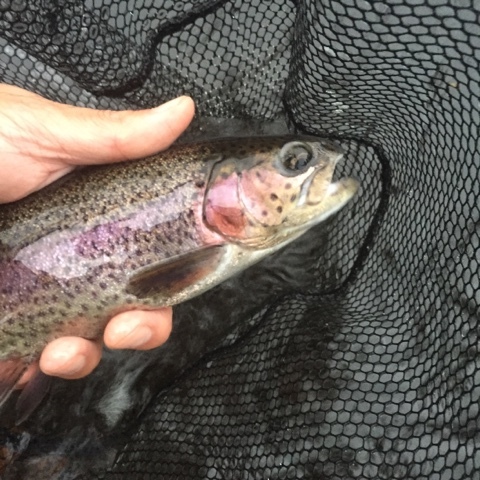 I really like it when trout jump on a swinging fly. They are aggressive and mean business. 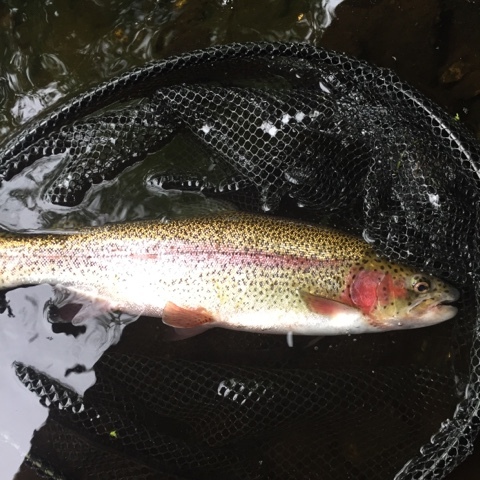 And, I was glad that I’m getting better at setting a hook while fishing downstream: keep the line taut during the drift, and, if the line tightens, gently raise the rod tip and let the trout hook itself. Pulling back on the rod risks pulling the fly out of the fish’s mouth. Spot B is another go-to spot. A very long and very deep run. That too required some work. The fish weren’t in the usual tailout section of the run. Those areas are getting more shallow with each week. Instead, the fish were more up river than usual, hiding and feeding just below the riffles. I think that makes sense. As water warms and fish get pressured, they learn to hide in or near the riffles, both to get oxygenated water, but, also, to flee anglers. It’s the type of “B water” that most anglers skip, and it’s one reason why anglers in Europe started tightline nymphing without an indicator. 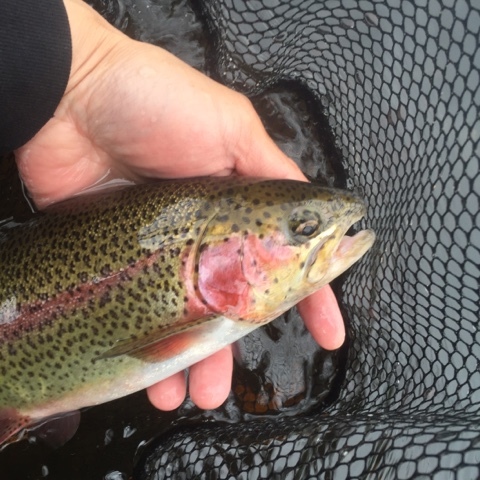 Riffles and pocket water can be loaded with fish. At Spot B, the Euro Golden Stone crushed it. 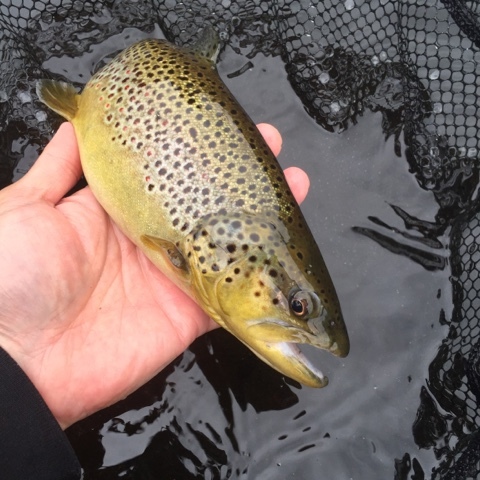 Four trout, including a fat brown, and three smallies came to the net. They didn’t want anything to do with a Caddis Emerger. So, a total of 14 landed fish all in all. Stopped fishing by 11 am and headed home. The water was 72 °F. So, fish the freestones while you can. It feels like a long and hot summer is coming. Photos below. 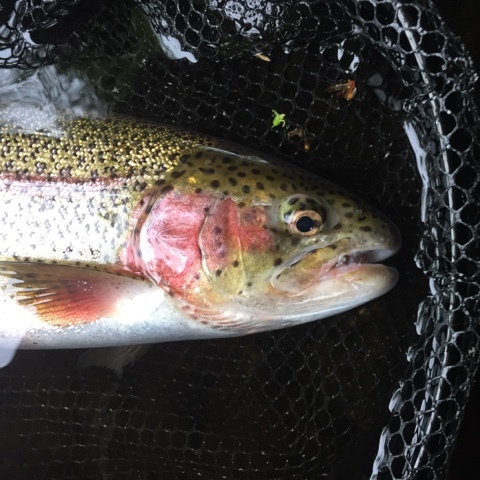 Nice looking fish, and I'm not surprised they took those flys, the caddis emerger looks great, and the golden stone is a fly I'm going to try tying up myself.